Once you have harvested your first early potatoes, you can enjoy them in a dizzying array of ways. New potatoes are, perhaps, one of the most versatile crops of the season, and can be cooked up in a wide range of different recipes, either as a side dish, or as the main attraction. Whether you are a meat eater, vegetarian or vegan, you can enjoy any of these five recipe ideas for first early potatoes, which can help you make the most of this delicious seasonal staple. As a side or as a main meal, simply boiling first early potatoes and enjoying them with herbs is a classic. Making a basil pesto, or another herb pesto with herbs grown in your polytunnel, can really bring out the subtle, delicious flavour of the spuds. 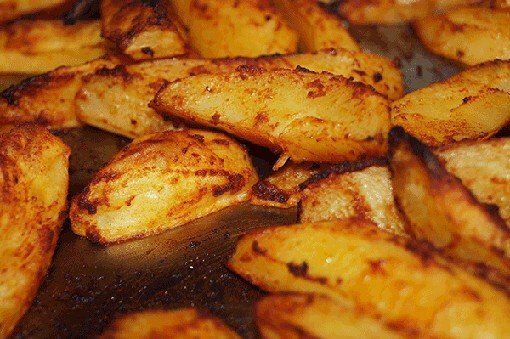 Many people do not realise that you do not have to boil new potatoes. You can also bake or roast them in the oven – with delicious results. One of the very best ways to bring out the brilliant flavours and texture of first early potatoes is to roast them with a dash of olive oil, and intersperse them with some cloves of garlic and sprigs of rosemary. Of course, new potatoes also lend themselves very well to being cooked and then eaten cold. A cold new potato salad can be a delicious meal for a hot day. Using first early potatoes as a salad base is also a good way to use up some of your other seasonal vegetables, such as peas, leafy greens like spinach, and lettuce. Make a zesty delight with fennel leaves and lemon, or keep things classic with a pinch of parsley and a more traditional dressing. One great idea for a warm, hearty meal is to slice your new potatoes, layer them with leafy greens, and slather them with a white sauce before topping with cheese or breadcrumbs. For a vegan twist on the classic gratin, make a cashew cream with nutritional yeast to give a creamy texture to your gratin, and top with crunchy breadcrumbs, or, for an extra boost of nutrition, some mixed seeds. Fancy something a little bit spicy? New potatoes lend themselves very well to inclusion in a range of different curries – from dry Bombay style potato curry, to an aloo dum with tomato-based curry sauce and coriander. A curry can be a great way to use up a whole range of different vegetables from your polytunnel. Of course these are just a few of the many, many ways in which you can use your polytunnel grown first early potatoes. Do you have your own favourite recipes? Let us know your favourite ways to use your new potatoes in the comments below.